Dimensions (HxWxD): 5.75" x 4" x 2.75"
This gorgeous all natural, untreated, unheated Brazilian Smoky Rutile Altar Flame, measuring 5.75 inches high, weighs 1.75 pounds and is a true mineralogical collector's item as well as a superb Lightworker's power tool! 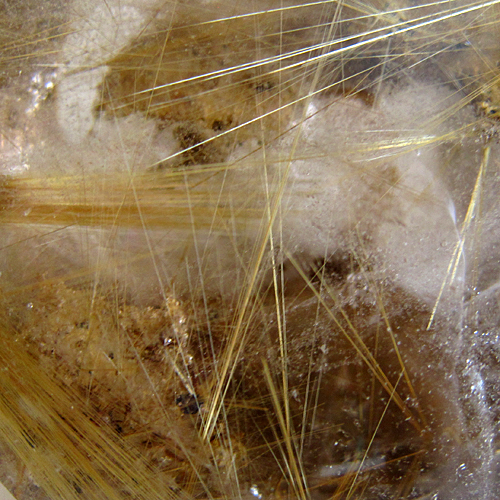 You can see a beautiful landscape within this lovely Smoky Rutile Altar Flame, created by the matrix clinging to the back of the crystal, some brilliant rainbow inclusions and the many beautiful golden shafts of titanium metal, known as rutile, that criss-cross the interior of this remarkable crystal. The combination of smoky quartz and rutile filaments exhibited by this Altar Flame provides a relaxed yet stimulating energetic experience, perfect for meditation or as an uplifting addition to your living area, bedroom or workspace. Rutilated quartz pendants, in my experience, when worn or carried on the person, act as a stimulant to the nervous system and the etheric body. 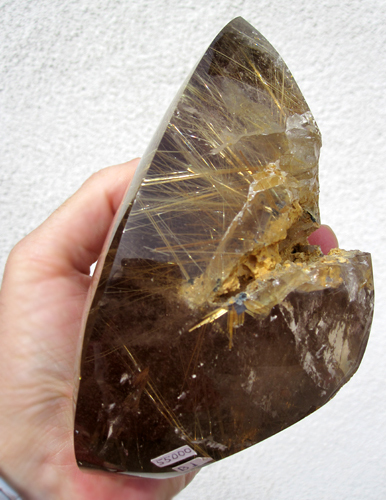 Jane and I have used Smoky Rutile crystals in meditation and in our Reiki practice, and we are amazed by their complex and powerful energy. 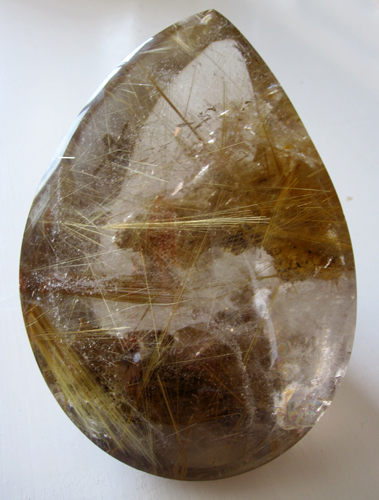 During meditation and in Reiki sessions, we found that the Smoky Rutile Crystals impart a deep, energizing & nurturing warmth, most noticeable first in the “hara” center, the storehouse of Universal Life Force Energy, or “chi”, located two fingers width below the belly button. This warm glow expanded throughout our bodies, then extended out into the aura, enlivening and brightening body, heart, and spirit. 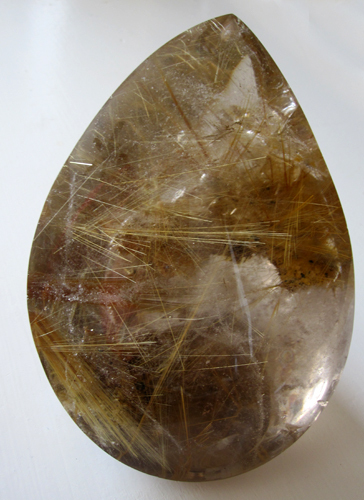 Although many forms of rutile accelerate intellectual activity, Rutilated Smoky Crystals relax the Higher Mind, quieting the stream of conscious mind chatter and stimulating consciousness to connect to the wisdom found in a realm of a more universal wisdom, clarity and enlightenment. We also found these unusual Smoky Rutile Crystals to be very helpful companions in order to restore vitality and gently triggering needed catharsis of negative emotional baggage. 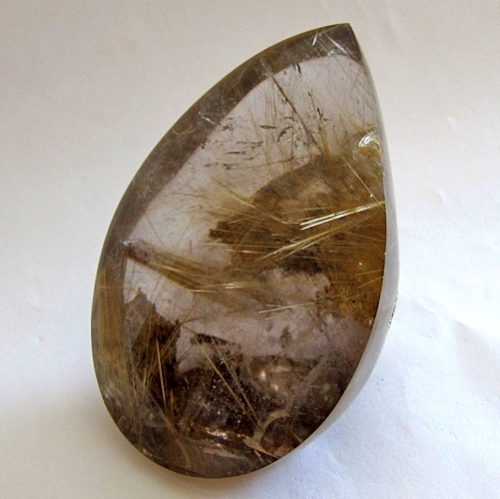 Reiki clients report that Smoky Rutile Crystals provide a warm, nurturing, yet energizing effect on the body and mind, noticeable for periods of time up to several days after treatment. We know that you will use this powerful crystal with loving wisdom and respect its long journey in the Earth that has lasted for many long historical cycles. This crystal is a powerful tool, a love-gift from the Divine Mother to you! Note: Above weight is shipping weight. Net Weight: 28 ounces, or 2802 grams, or 1.75 pounds.